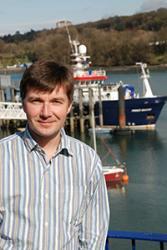 Michel Kaiser, Professor of Marine Conservation Ecology at Bangor University is to chair a new Science Advisory Group (SAG). The seven-strong Group is charged with ensuring that Seafish, and therefore the UK seafood industry, has access to the best possible scientific evidence, and where relevant, increased engagement with the scientific community. Its ultimate goal is to empower greater evidence-based decision making within the sector. The first meeting of SAG will take place on November 12th in London.